Dawson Engineering is owned and operated by Wayne Johnson who started the business in 1974. Wayne established this business to provide quality products and services for local livestock producers. The business was originally focused on manufacturing custom parts like crates, gates, stalls, panels, etc. Over the decades the business has transitioned to specializing in remodeling and repair of existing hog barns. 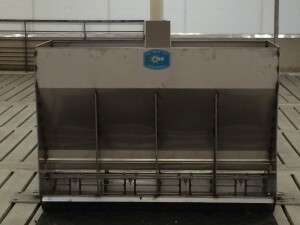 Dawson Engineering can provide the new or refurbished materials you need to make your swine operation run smoothly and efficiently without spending all of the barn profits! Today at Dawson Engineering we are your source for new, used and refurbished farrowing, nursery and finishing equipment. Located on Highway 212 in Dawson Minnesota, Dawson Engineering specializes in service and repair for regional hog producers. Dawson Engineering strives to offer a quick response to all repair service calls and keeps a wide variety of parts and supplies on hand at all times in the shop. 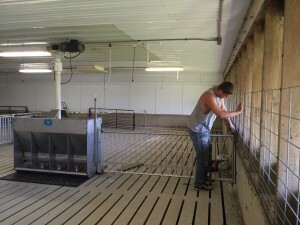 For pig barns that are ready for remodeling, Dawson Engineering is your complete source for the job at a reasonable cost. The talented and knowledgeable staff from Dawson Engineering have many years of experience in installation, construction, remodeling, and maintenance that are a perfect low cost option for your hog operations. Dawson Engineering is known for the quality parts and products they manufacture as well as refurbish to custom fit your swine facility. There is no job that is too small to be a priority for Dawson Engineering. At Dawson Engineering we believe that all hog producers are a critical part of our rural economy and we are here to serve You!